'Shining Prince' (Shuichi Hirao by Society for Japanese Irises, R. 1991) Sdlg. SH-24. JI (6 F.), 37" (94 cm), Midseason bloom. Deep violet (RHS 86A), blue halo and white veins washed blue, yellow signal; style arms white. Parentage unknown. Society for Japanese Irises 1992. From AIS Bulletin #289 April 1993 Introducing SHINING PRINCE (Hirao '92). Sdlg. SH-24, Japanese, M, 37", 6 falls. In Japanese classical literature the "shining prince" is Genji, hero of Lady Murasaki's The Tale of Genji. 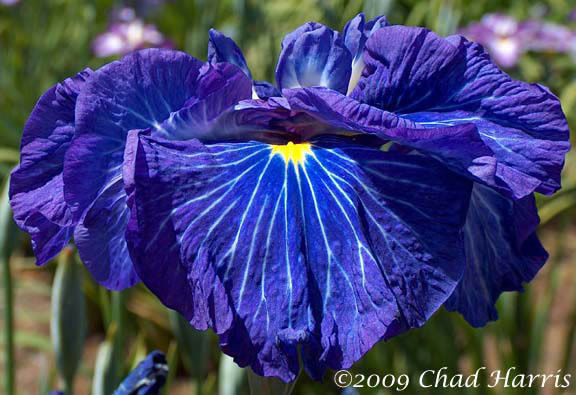 Only an iris of grandeur and great beauty could bear such a name! Deep violet color with shining blue halo and white veins "washed" blue. White styles for additional contrast. $30.00. The Iris Pond. jpg IMG_2594-X2_shining_prince.jpg manage 330 K 20 Feb 2016 - 05:59 BrockHeilman Please contact Brock Heilman for image use.